Quercus prinoides.Copyright © 2001 by Kevin C. Nixon.www.plantsystematics.org. (Accessed 7/2014). 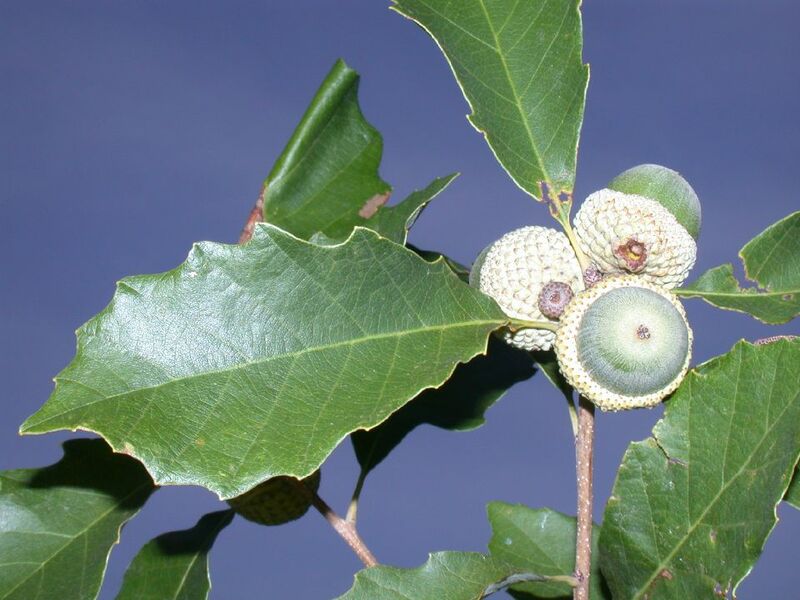 Quercus prinoides is a shrubby tree to 3 m tall, colonial from stolons, white oak group (subgenus Lepidobalanus). Leaves alternate, widest above middle, to 10 cm long, lobed like those of Q. prinus with 5-8 low, usually rounded teeth per side, base wedge-shaped, bright green above, white-hairy below, leaf stalk to 1 cm. Flowers: male flowers elongate clusters of catkins, female flowers solitary or few, very small. Fruit: mature acorns to almost 2 cm long, base rounded, cup covering about half of nut, scales fine. Seeds dispersed by squirrels, probably by blue jays (Johnson and Adkisson 1985), and other animals that bury acorns. Habitat: Dry, rocky or sandy, often on rich calcareous, soil pH 5-8.5. Oak barrens and scrub. Tolerant of drought. Intolerant of shade, flooding, soil compaction (Hightshoe 1988). Notes: Acorns eaten by many birds and mammals that do not bury nuts (raccoon, foxes, deer, voles) white-tailed deer, squirrels and white-footed mice are major predators of acorns (Martin et al. 1951).